Will Short-Term Rentals Be Limited in Northern Michigan? Short term rentals: be aware of Airbnb pushback. Among members of lake associations, condo associations and local zoning boards, setting limits and operating rules for short-term rentals has long been part of the conversation—sometimes contentiously so. But online booking services like the longtime player Vacation Rental by Owner (VRBO) and the surging Airbnb have poured kerosene on a smoldering fire, explains cottage law attorney Dan Penning. By making the marketing and booking of short-term rentals so easy, the services have lured thousands upon thousands of home and cottage owners into the business. In many cases, rental income becomes a necessary financial pillar of cottage ownership, paying upkeep and high non-homestead taxes—especially those levied on lakefront property. In other cases, short-term rental income is what makes a cottage purchase financially possible in the first place. Lakefront properties, in particular, are proving challenging because they attract people on vacation, many looking to live it up for a week or two and not worry a lot about the consequences. “Typically, cottages are close together, and if you have a neighbor renting all the time, you have a new neighbor every week, and some of them will invite their relatives, and friends of their relatives and suddenly you have 30 people staying next door,” Penning says. Throw in multiple powerboats, music into the night and lots of beer, and you have a ruined neighborhood, or at least seriously damaged neighborly relations. “I’ve even heard of people subletting rooms in the cottages they are renting for the week,” Penning says. In many cases, the non-renting neighbors are pushing back, advocating for tighter rules within their associations and zoning boards. This means people who need short-term rental fees to afford a cottage need to proceed with eyes wide open to the possibility that the practice could be curtailed, or they need to be ready to advocate for their own interest if they see local zoning boards taking up the issue. Meanwhile, courts have taken up the issue, too, says Penning. “Courts in Michigan have often taken the side of those trying to stop the rentals, saying that if zoning or association rules say there is no commercial use allowed, the rental is commercial use and should be stopped,” he says. But some courts are siding with the rental owner, saying the property is simply being used as a residence, so it qualifies as residential. “There is currently a case before the Michigan Supreme Court that could shed more light on how this will proceed,” Penning says. His best guess: “I suspect the court will come down in favor of limiting the short-term rentals.” Stay tuned. Comment below and let us know what you think should happen. 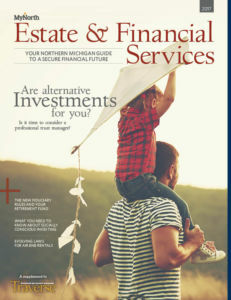 Find more financial advice in MyNorth’s annual publication of Estate & Financial Services—free! Click the cover to read.